Honokaʻa Western Week Rides Again! 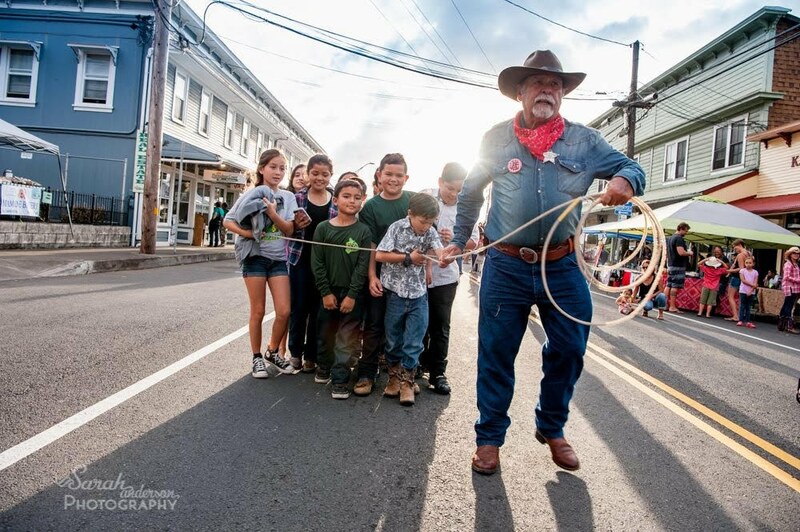 Hāmākua’s favorite cowboy party, Honoka‘a Western Week rides into town May 18-27, 2019, celebrating the region’s fun and fabulous paniolo heritage. Our paniolo legends worked hard, played hard, and loved their ‘ohana. Western Week brings together the entire family, keiki to kupuna, for a whole passel of festivities. New this year! The colorful Paniolo Parade kicks up its heels and boots up Western Week on Saturday, May 18. The Block Party begins when Mamane Street closes to vehicle traffic at 2 pm. At 4:00 pm spectators in western wear will line Mamane Street to watch a cavalcade of colorful horseback units, including the Hawaiʻi Saddle Club, local clubs and bands and a whole lot more as the Parade begins! Event organizers are recruiting talent now for the Saloon Girl and Cowboys Got Talent Contests—both happening at the Block Party. Men and women who love the spotlight are invited to dress up in their best boots and fancy duds, and strut their stuff in a talent competition on the street side stage. There are no entry fees, and entrants compete for generous cash prizes. “No experience required!” said Western Week chairperson Michelle Hartman. “The more contestants we have, the more fun it is for everybody. This is definitely not a beauty pageant, and we welcome all kinds of talent. Our past winners have been folks of all ages, shapes and sizes—singers, dancers, comedians—it’s all about letting your hair down and having some fun with the crowd.” For more information and entry forms, please email Brad Bordessa at bbordessa@gmail.com. Western Week continues Sunday, May 19th at the 4th Annual Hamakua Harvest Farm Festival, a learning, shopping, and, of course, eating experience. Monday, May 20th will bring Cowboy Stories from Umikoa Village, Kukaiau Ranch to the Library. On Tuesday, the young buckaroos create their stick horses for the races at the NHERC Pavilion. Then, Wednesday, everybody’s favorite Portuguese Bean Soup & Sweetbread Contest is happening at the NHERC Pavilion. Thursday will bring an afternoon of fun for the kids, Keiki Rodeo Games at the Rodeo Arena. On Friday afternoon starting at 5:00pm, the Honoka’a People’s Theatre will host a showing of Steve Roby’s Western Week Movie, followed by an astonishing Western Fashion Show and finishing up with Line Dancing from 7-9pm! Saturday, May 25th the Hawaiʻi Saddle Club Scholarship Rodeo begins with the qualifying day, known as “Slack”. The full rodeo show begins at noon on both Sunday the 26th and Monday the 27th. The Hawaiʻi Saddle Club Scholarship Rodeo is the biggest rodeo in the state of Hawaiʻi and generates over $10,000 in scholarships for students every year. Contestants and spectators come from all over Hawaiʻi and from the mainland to be part of the rodeo. The first rodeo was put on in 1954 by the Hawaiʻi Saddle Club, a small group of cowboys who loved the way of life and wanted to showecase the skills and traditions of the Hawaiian Paniolo. The rodeo has been held in Honokaʻa annually ever since. Commemorative HWW buttons will be available to purchase as a show of support, as well as automatic entry in the “lucky number” drawing during the Block Party. Although buttons are not required for admission, attendees receive fair warning that those without buttons at the Block Party risk being thrown into the hoosegow by roving sheriffs. (All in good fun). Folks won’t want to miss out on this year’s unique Honoka’a Western week tee shirt!! Honoka‘a Western Week is a volunteer-driven project led by the Honoka‘a Business Association, the Hāmākua Lion’s Club, Councilwoman Valerie Poindexter, Steinlager, and many other sponsors and supporters celebrating Hāmākua’s paniolo heritage and unique cultural blend. Checks payable to “Honokaʻa Business Association” can be sent to to P.O. Box 474, Honokaʻa HI 96727, attention: Honoka‘a Western Week. For more information, Western Week on Facebook or check out the Honoka‘a Western Week website @ www.honokaawesternweek.org.